We packed slowly in the morning and started on the trail. We hadn’t gotten far when we spotted the sisters heading towards us. They actually looked worried. They approached us quickly. Something had to be wrong for them to show themselves to us. I thought to run ahead, but my blistered feet would not allow it. As they got closer Janna stopped and raised her hand in front of her. Ashlyn started to circle. I we turned but saw nothing coming up the trail. We all looked back for clarification. I tried to laugh but nothing came out. “That’s Melsa!” I called back. I left the chorus in the original lyrics because I like the contrast. 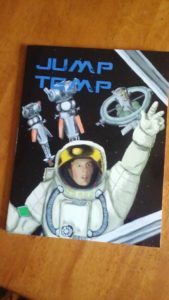 I got my first hard copy of Jump Temp! Woooo! Getting a hard copy always helps with figuring out what the finished product should look like. For example, some of my image placements need to be moved to the other side of the page so they’re not in the crease of the book. At least one picture needs to be moved to another page. Another thing that becomes obvious is that since a color print is needed for the star maps and most of the art is black and white, there needs to be a lot more color on the pages from layout elements. So far I haven’t run into typos yet, but it would be a rare thing to have caught them all by this stage.